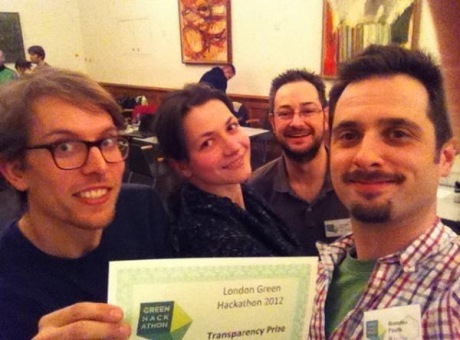 Students from the UCL Energy Institute excelled at the London Green Hackathon held on 28th-29th January at UCL with two PhD students winning prizes. Will Usher was part of a team of four that won the Transparency Prize for their project ‘Company Carbon Death Map’. The app shows a map of the world with the logos of FTSE100 companies located around their HQ countries. A slider along the bottom allows users to see at which point companies ‘go extinct’ i.e. at what carbon price the cost of a companies’ annual CO2 emissions outweighs their annual earnings. The team are planning to revisit the app, and put it on a website for everyone to play around with soon. Tia Kansara also had great success with winning the Built Environment Prize.